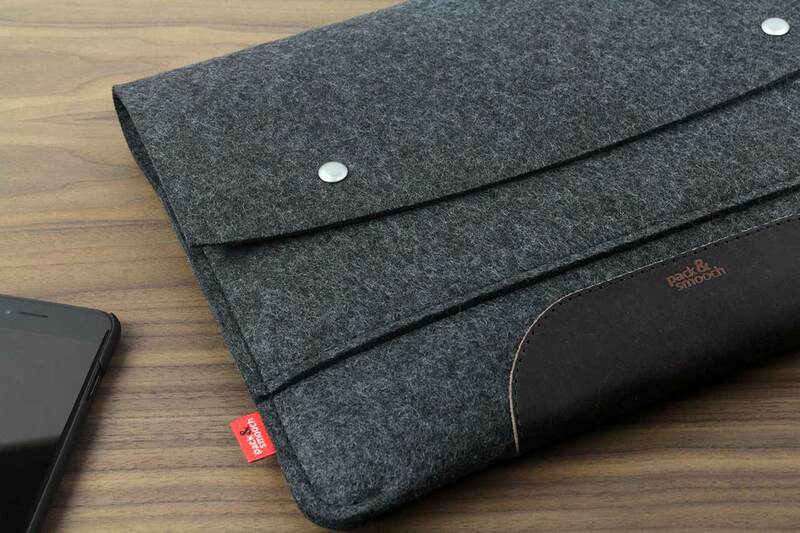 Product information "MacBook Pro and MacBook Air Merino wool felt and natural leather case"
Serious slim style for any MacBook lifestyle. 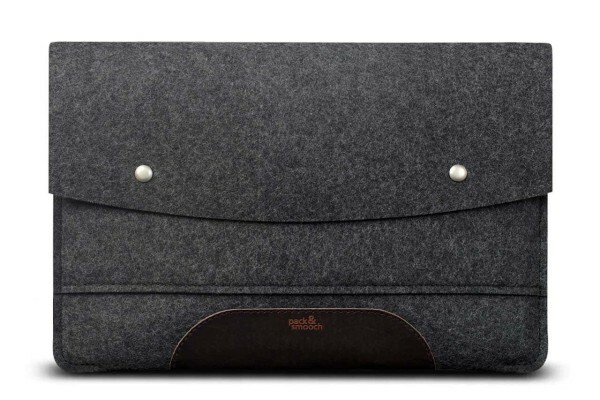 The Hampshire is tailor-made for the "Twelve" to "Fifteen" from the MacBook / MacBook Air family. Thanks to the sophisticated features like the power cable slot and a special front pocket for the USB-C adapter, you never want to take your MacBook out of its sleeve again. 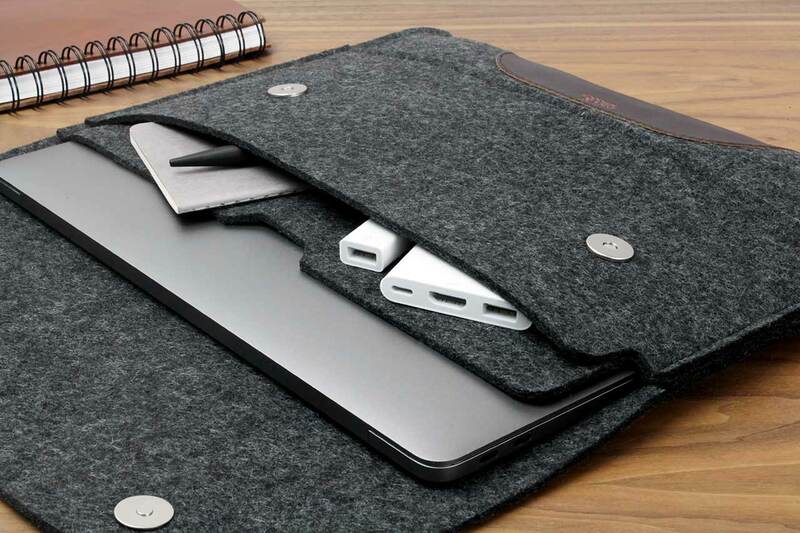 Ultra flat magnetic locks make this laptop sleeve your favorite understated accessory. 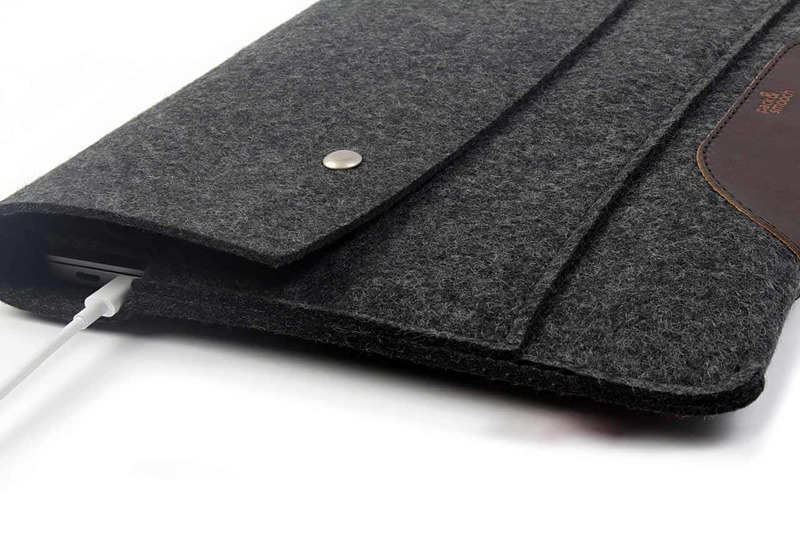 The high-quality and natural materials Merino wool felt and Italian leather round off the minimalist design and create a lot of potential for Hampshire to become your favourite MacBook cover. 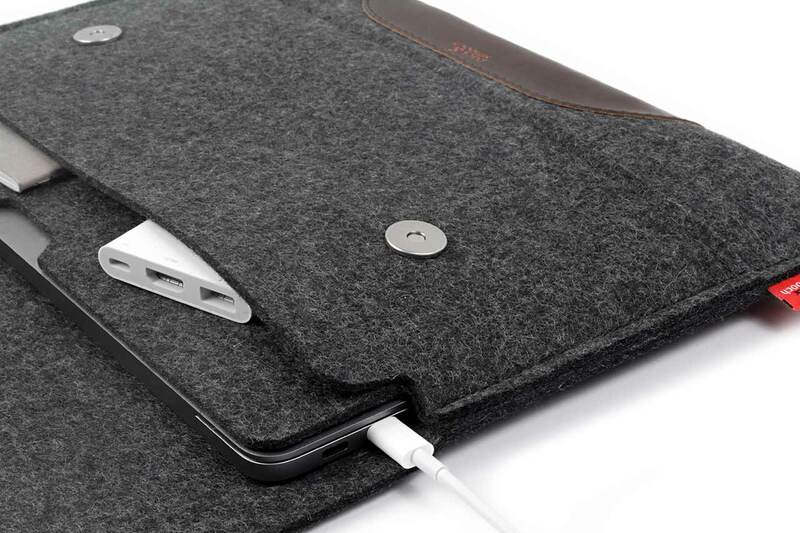 Related links to "MacBook Pro and MacBook Air Merino wool felt and natural leather case"
Our MacBook sleeve Hampshire for MacBook Air 13 (2018) MacBook 12 , MacBook Pro 13 and MacBook Pro 15 are easy to clean and care for. If the wool felt becomes slightly soiled, the product can be carefully cleaned with a damp cloth. Heavier soiling can be treated with a mild soap solution and dried with a soft cloth. Small scratches in the leather can usually be gently rubbed out with a damp cloth. Larger scratches can be removed with a little bit of leather wax applied with a soft cloth. 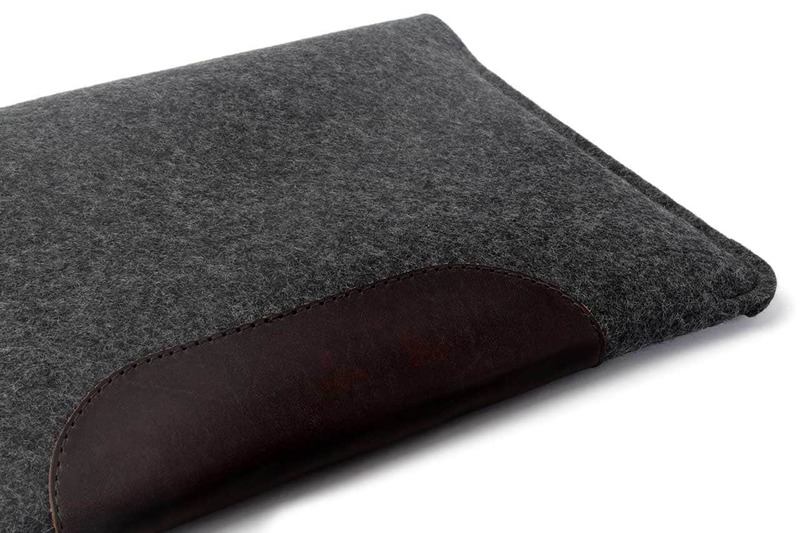 Customer evaluation for "MacBook Pro and MacBook Air Merino wool felt and natural leather case"
Ich war sehr lange auf der Suche nach einer passenden Tasche für mein MacBook Pro 13“. Ich weiß gar nicht mehr wie ich auf diese Seite hier aufmerksam geworden bin - habe mich sehr lange hier durchgeklickt und bin bei einigen Produkten hängengeblieben. Unteranderem bei dieser Tasche hier. MacBook. Finde ich super, das dass Gerät kein Spiel in der Tasche hat. Das Material ist super schön und fühlt sich einfach toll ab. Die Mischung aus Filz und Leder ist perfekt. Ich habe gleichzeitig die kleine Kabeltasche bestellt und bin nun perfekt ausgerüstet wenn es mit dem MacBook auf Reisen geht. Ich kann die Tasche einfach jedem empfehlen der etwas hochwertiges für sein MacBook will. Hervorragende Verarbeitung, cooles Design! Ich benutze die Hülle täglich mit großer Freude. Das Material fühlt sich toll an und wird im Laufe der Zeit immer schöner. Der Preis ist voll gerechtfertigt. Kann ich uneingeschränkt empfehlen. Super Hülle, unbedingt zu empfehlen, top verarbeitet!